Put some sparkle in your bubbly with this wonderful blend of hearts and champagne! 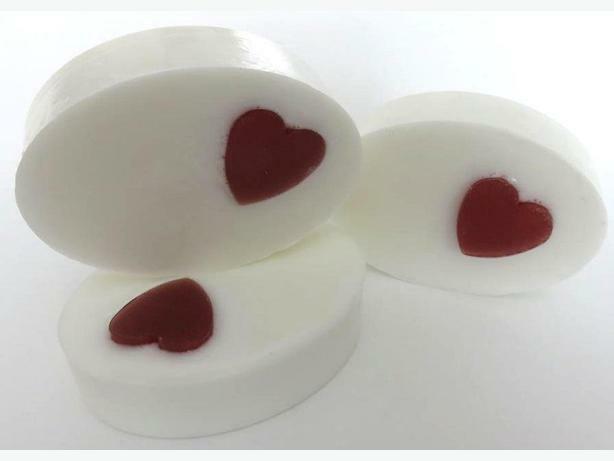 With 100% moisturizing glycerin (including the glycerin hearts), this unique looking soap is perfect for many occasions. Also available in red decorative heart shapes, hearts with Celtic knots and beige hearts with a 'red sweet-heart' inside, which will appear over time & use. "You are the last thought in my mind before I drift off to sleep and the first thought when I wake up each morning." We start with a 100% vegetable glycerin base, then we add extra ingredients that are healthy and moisturizing for the skin. So, basically a bar with all of the "good" and none of the "bad" which looks and smells amazing, so you can get clean and moisturized all in one step. The main ingredient, our glycerin soap base (imported from the U.K.) is produced from the highest quality double distilled and deodorized clear coconut oil, forming luxurious lather and sparkling clarity, and is specially formulated, tested and certified for soap making. It is also a certified Kosher and Vegan product which is GMO-free and allergen-free and contains no alcohol or harmful products to dry your skin. Glycerin, a natural emollient, draws moisture out of the air to benefit skin health. It cleanses without stripping or upsetting the delicate natural pH balance necessary for soft, healthy skin. And, since we don't use animal oils, our soap rinses clean and leaves no soapy film behind.